aFe Cold Air Intake for 2002-2006 R50 MINI Cooper and 2005-2008 R52 Cooper Cabrio. 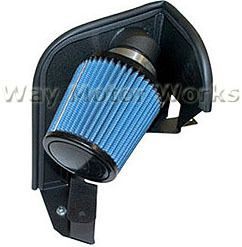 This intake made by aFe is one of only a couple options for the MINI Cooper non S models. Kit comes with a new inlet hose, small heat shield, mounting hardware, and a dry or oiled air filter option.